☎ Telephone: 0086-755-82436053. Please note, the operator speaks Chinese only.  Opening Hours: 01:30 to 21:00, Monday to Sunday.  Getting there by Metro: Shenzhen Metro Line 9 stops at Yinhu Station (银湖站). Travelers can leave from Exit D to walk directly to Shenzhen Coach Station.  Getting there by Bus: City bus routes 4, 5, 46, 201, 218, E11, E24, M240, M358, M435, M437, M454, M460, N6 and etc. stop at Yinhu Bus Station （银湖汽车站）. ☝ Shenzhen Coach Station, also known as Shenzhen Yinhu Coach Station, locates in the same building with the three star Vienna Hotel in Luohu District with Bijiashan Park less than 3 kilometers to its south. 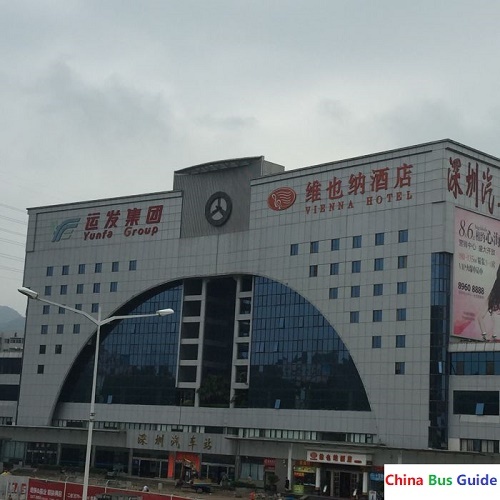 Traveler's Note: Shenzhen Coach Station has the biggest number of bus routes with the most frequent bus departures among all long distance bus stations of the city. Here you can also take direct buses to travel to Guangzhou Baiyun International Airport.